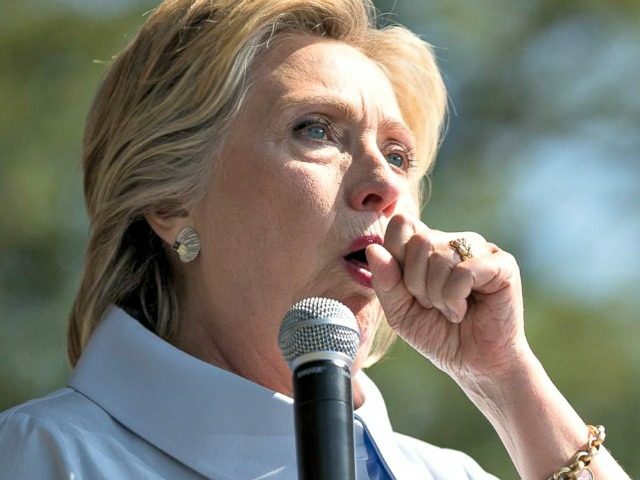 NEW YORK – Monday’s coughing fit is not the first time seasonal allergies have been blamed for interfering in Hillary Clinton’s public schedule. State Department statements and recently released Clinton emails show the politician was missing in action in early May 2009, with a State spokesperson at the time blaming “mild allergies.” The corresponding emails reveal Clinton’s health problems prompted her at the time to request an Air Force plane instead of taking a shuttle from Westchester, New York, apparently to get to Washington, D.C. QUESTION: This is slightly odd, but the Secretary, in her two appearances this morning, appeared to be a little ill. Is she suffering from a cold or something? And I ask only because of the whole swine flu thing and the fact that she was in Mexico in March and the fact that a member of the – one member of the President’s delegation did come down with it. WOOD: Matt, you’ll be happy to know it’s just mild allergies. She suffers from mild allergies. That’s all it is. Emails released earlier this month show that on the same day – May 4, 2009 – Clinton wrote to her top aide Huma Abedin, “I still don’t feel great,” and requested an Air Force plane to fly her instead of the shuttle from Westchester, New York. The emails, first reported by Breitbart News, were part of 725 pages of new State Department documents released in response to a Judicial Watch Freedom of Information (FOI) lawsuit. The email exchange shows that Abedin helped to arrange a C21 cargo and passenger airlift plane to pick Clinton up in White Plains, New York. About one month later, on June 19, 2009, Clinton was said to be resting in her Washington home after surgery on a broken right elbow from a reported slip-and-fall incident at the State Department garage on her way to a meeting at the White House. On Monday, Clinton suffered a very public coughing fit disrupting her speech for over four minutes during a Labor Day campaign event alongside running mate Tim Kaine in Cleveland, Ohio. That same day, Clinton retreated to the back of her campaign airplane while speaking to the press because of yet another coughing incident. Clinton blamed the pesky cough on seasonal allergies. And Clinton gamely talked about a pesky cough, which caused her to retreat to her section of the plane about 15 minutes into the session with reporters. After the plane landed here, she returned for several more minutes. A letter released by Clinton’s physician in July 2015 dubbed Clinton in “excellent physical condition,” but noted she was diagnosed at the time with hypothyroidism and seasonal pollen allergies and was taking the medications Armour Thyroid and Coumadin daily. The letter, from Clinton’s physician, Dr. Lisa Bardack, further stated that in 2009 she suffered from deep vein thrombosis and the elbow fracture that year. Bardack provided some information about a 2012 incident in which Clinton was said to have suffered from a blood clot and concussion.